We are established ourselves as coveted organization, involved in manufacturing, supplying, and exporting a wide range of Disposable Face Mask. These face masks are designed with the help of experts using superior quality raw material. Our disposable face masks are widely used in various industries such as medical, pharmaceuticals, and electronic industries. Before the end dispatch, all these masks are thoroughly scrutinized under the supervision of quality examiners before final delivery. The face mask offered by us are available to clients in various shapes and sizes. 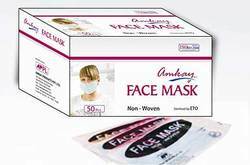 Offered by us is a comprehensive range of Non Woven Face Mask. Further, our professionals manufacture these products using high-grade quality raw material, procured fro authorized vendors of the industry, in tandem with highest quality standards. We make these products available to the clients in varied specifications and at leading prices in the market, in order to meet their variegated requirements. In order to fulfill the ever changing demands of our clients, we have been engaged in manufacturing and exporting a wide gamut of Face Mask. 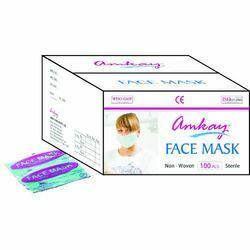 These face mask are manufactured using quality assured raw material, procured from authentic vendors of the industry. Our entire range of facial masks are designed in accordance with CE and ISO 9001 standard. The face masks offered by us are widely demanded in hospitals for its high protection level against air borne infections. Further, we offer these masks in various shapes and sizes as per the clients needs.